A honeymooner’s guide to Bali, including the most romantic places to go for a couple’s getaway. Find out where to eat, explore, relax and enjoy quality time together on Bali in 2019 as we reveal the most romantic and intimate places on the island. As one of the world’s most popular destinations for romantic getaways, Bali is the backdrop for thousands of honeymoons every year. But why do so many newlyweds choose Bali and why should you consider it? 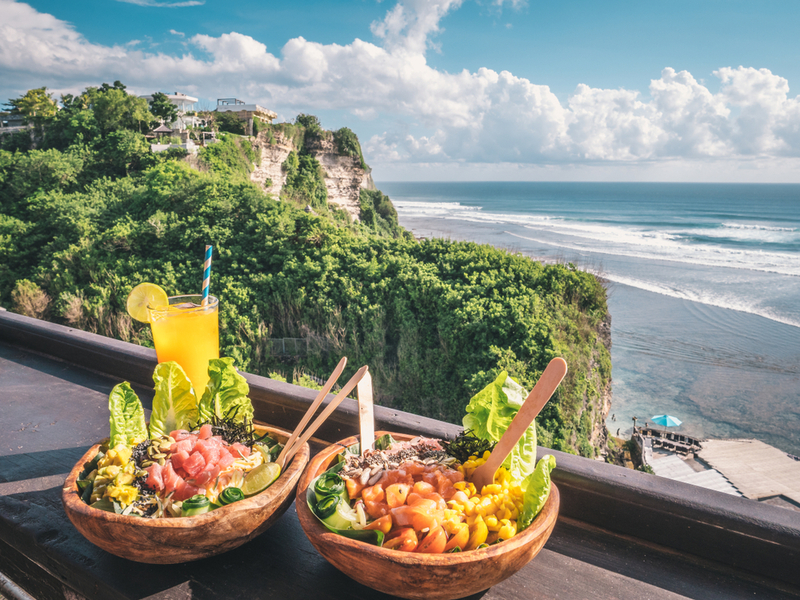 Breathtaking sunsets, fine dining options, dream accommodation and heaps of natural beauty are obvious reasons for Bali’s popularity among lovers. However, the island also has dozens of options for exploring, relaxing, partying and trying new things while you’re there. 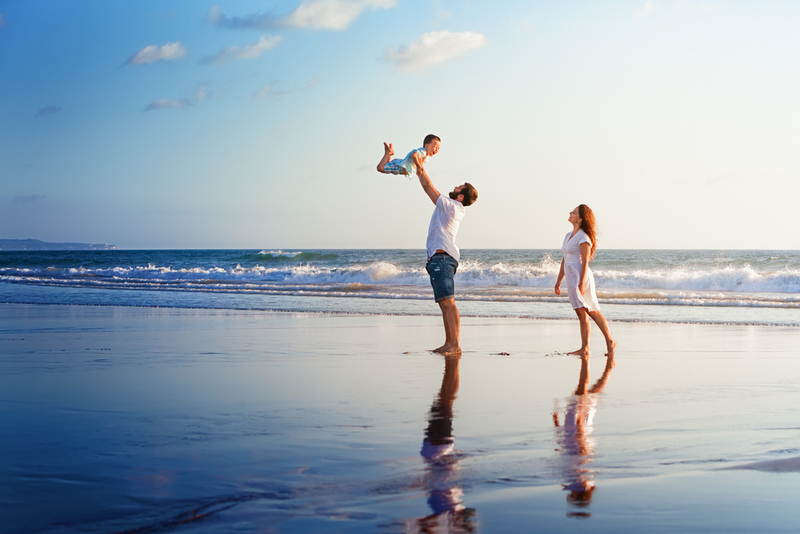 This means you can plan a trip that’s tailor-made, perfect for you and your partner. Whether you want to luxuriate in a spa, get sweaty hiking to Bali’s hidden gems, or absorb the local culture, Bali has something for everyone. 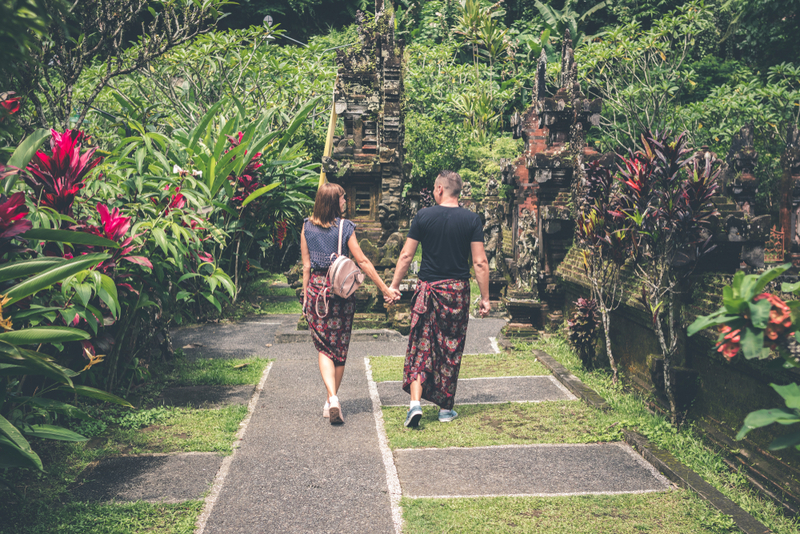 Read on to find out about the most romantic sights, activities and restaurants in Bali, for an unforgettable honeymoon. Just a stone’s throw from Bali’s southeastern coast lies Nusa Penida, the largest of the three Nusa islands. Densely forested and sparsely populated, this jungle paradise is a secluded haven far from the bustle of Bali’s mainland. For newlyweds seeking their own private adventure and lots of one-on-one time together, it’s the perfect place to visit during your honeymoon. 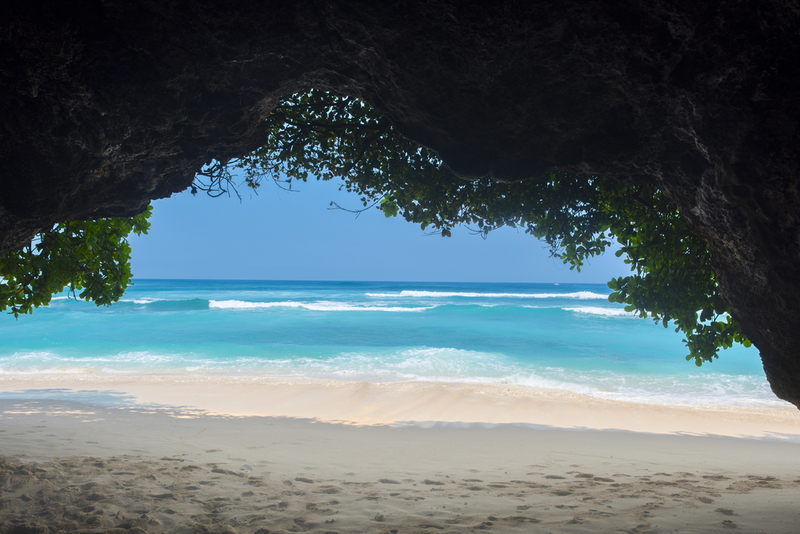 Broken beach is one of Bali’s most stunning natural wonders and is located on the southwestern coast of the island. Travel by motorbike to see this colossal collapsed cave, which forms an incredible walled bay at the foot of towering cliffs. This unique coastal formation is a must-see on Nusa Penida and a popular place to appreciate the raw beauty of the island’s coastline. The warm, tropical waters surrounding Nusa Penida house an abundance of marine life, from vibrant corals to manta rays. Take a snorkelling or scuba trip to Manta Bay for a chance to see these gentle giants in their natural habitat. This secluded swimming spot is located on the south coast of Nusa Penida and is easily reachable by motorbike. The steep gravel path leading down to the pool must be traversed on foot, however, as it is too steep and treacherous for bikes. Fortunately, the crystalline, freshwater pool you’ll find at the bottom is well worth the effort. Submerge yourself beneath the waterfall to cool off after your hike and enjoy the glorious ocean views together. 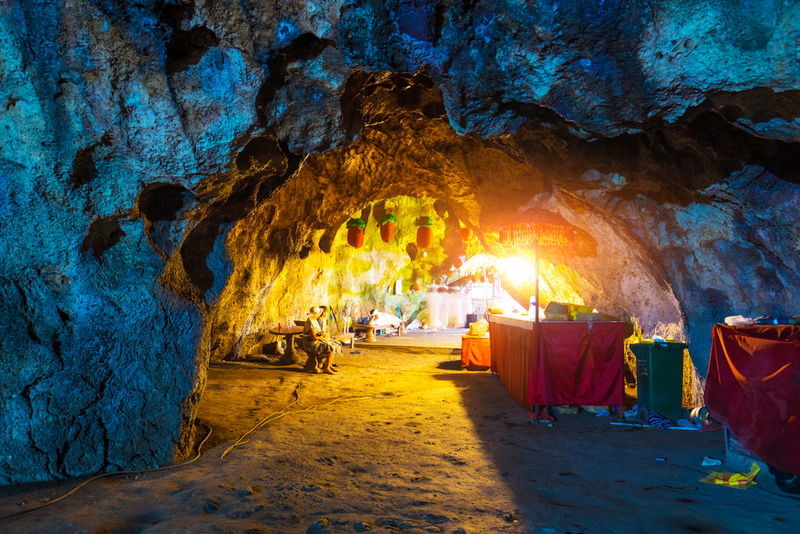 Soak up some local culture with a trip to Karangsari cave, which houses the exceptional Goa Giri Putri Temple. Visitors must enter one at a time through a low, narrow tunnel, before emerging into a much wider cavern. This holy site is large enough to hold 5000 people and is a unique monument to traditional Balinese religion. On the southeastern coast of Nusa Penida is the untouched, white-sand paradise of Atuh Beach. Stunning rock formations make this quiet beauty spot even more unique and it’s an idyllic location for a relaxed afternoon together. As the name would suggest, the Penida Colada Lounge Bar is best known for its outstanding cocktails. Go for breakfast, dinner, or lunch to enjoy their delicious seafood, or head over later in the evening for a drink. The beachside setting of this cozy restaurant is perfect for a casual, romantic meal on your honeymoon in Bali. For a relaxed and intimate dining atmosphere, head to Cocleaf Resto. This inexpensive restaurant specializes in both Indonesian and Western food and also serves delicious smoothies. Check out their dessert menu to satisfy your sweet tooth and enjoy the comfortable, charming interior as you dine. 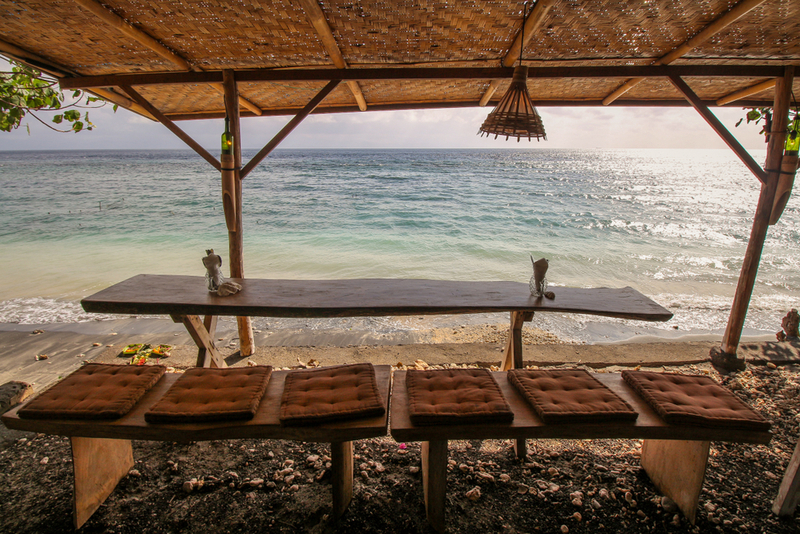 The Ogix Warung is one of the most popular dining spots in Nusa Penida. This exceptional yet inexpensive restaurant is best known for its delicious seafood and cool, stylish interior. Fabulous seafront views set off the whole experience, for a romantic meal you won’t forget. 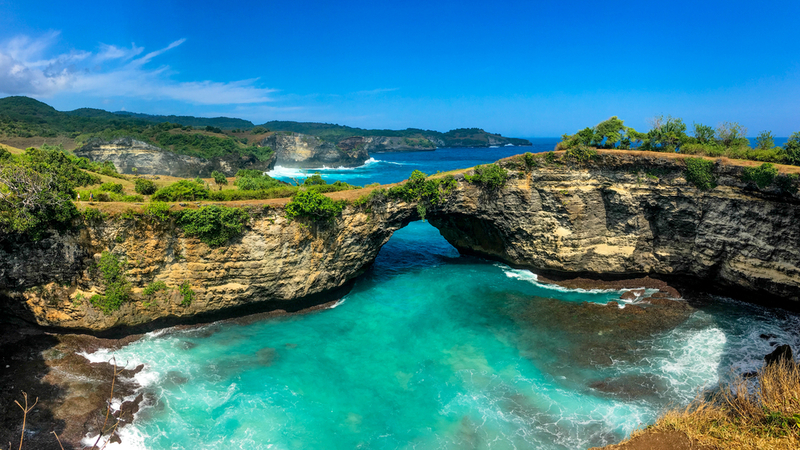 This famous surf spot has some of Bali’s most dramatic scenery and is a beautiful place to get married and spend your honeymoon. Rugged coastline, hidden beaches and breathtaking clifftop sunsets create a romantic and peaceful atmosphere and guests will love exploring the area. Uluwatu also has a handful of cool bars and venues by the coast, where you can celebrate with cocktails in the evening. The Uluwatu Temple is a must-see if you are honeymooning in the area. The cliff top views from this holy site are magnificent at sunset and set the perfect backdrop for photos with your loved ones. Retreat to your own private villa on your wedding night, to start your honeymoon in style! Uluwatu’s luxury villas are the ultimate place to enjoy your time together as newlyweds in Bali. Their elegant design and secluded locations create the most romantic atmosphere, perfect for spending quality time together as a couple. What better place to spend time with your soon-to-be spouse than in the secluded beauty of Uluwatu’s hidden beaches? Hike down the cliffside to Nyang Nyang or The Green Bowl and enjoy the ocean spray beneath overhanging jungle foliage. Celebrate your wedding in style at Single Fin, which serves a range of delicious cocktails atop a cliff top deck. Check out the Sunday night Single Fin party, when people gather from all over Bali to enjoy the live music and amazing atmosphere. Organising a wedding can be stressful, even in Bali. 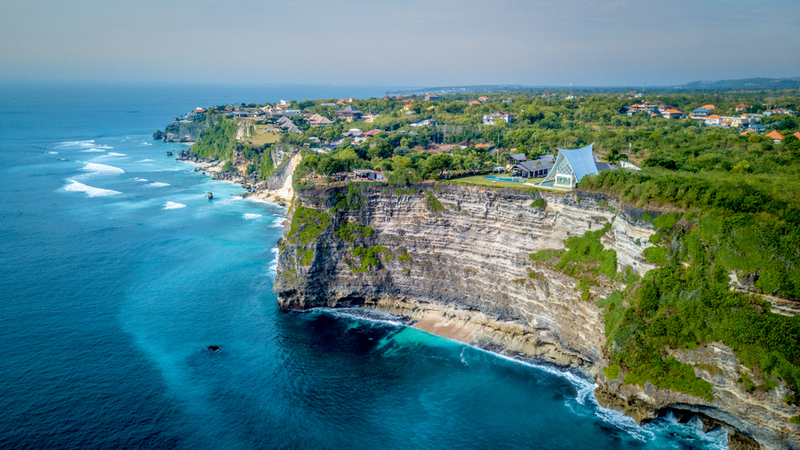 Fortunately, Uluwatu has an abundance of spas and massage parlours to help you unwind. Book a couple’s massage and enjoy some quiet time together while you prepare for your big day. Uluwatu’s formidable ocean swell attracts world-class surfers from around the globe. Don’t miss your chance to see the surfing elite do their thing out on the waves; grab a beer at Single Finn’s just before sunset to watch. For traditional Indonesian cuisine cooked to fine-dining perfection, make your way to The Warung. With stylish minimalist decor and a secluded seafront location, this restaurant is a must-visit during your trip to Uluwatu. Greet your friends and family in style with a meal at the spectacular Sangkar Restaurant. Sangkar serves exceptional Asian and Indonesian food in beautiful, airy surroundings, perfect for catching up with your guests. The restaurant is well-known for its panoramic ocean views; try to visit at sunset, when the sun sets the sky and ocean alight. For a romantic evening meal for two, head to DUGONG while you’re in Uluwatu. The stylish yet cosy bamboo structures create an intimate dining atmosphere and their seafood is exceptional! 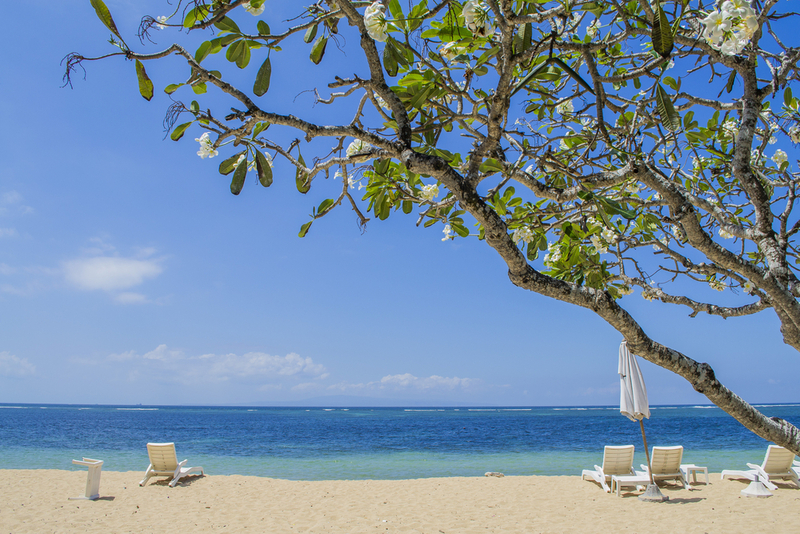 The beachside town of Sanur is best known for its gorgeous beaches, historical landmarks and chilled-out atmosphere. 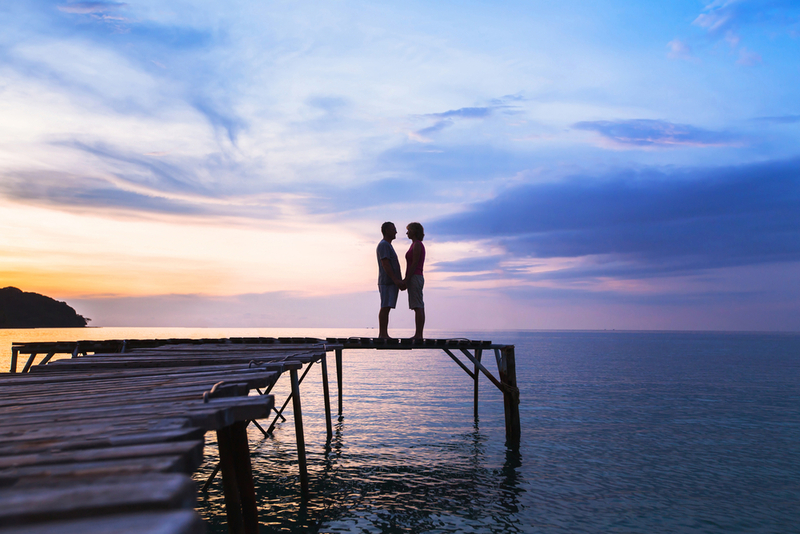 The spectacular sunsets, upmarket restaurants and luxury accommodation are any honeymooners’ dream and are perfect for a few weeks of relaxed, loved-up bliss Let’s take a closer look at why this sleepy seaside town is the perfect place for a romantic honeymoon in Bali. There may not be any surf around Sanur, but the strong winds mean conditions are perfect for kitesurfing. Even if you’ve never tried to sport before, Sanur is the ideal location to give it a go. Head out with an instructor for a day of high-octane fun on your honeymoon! 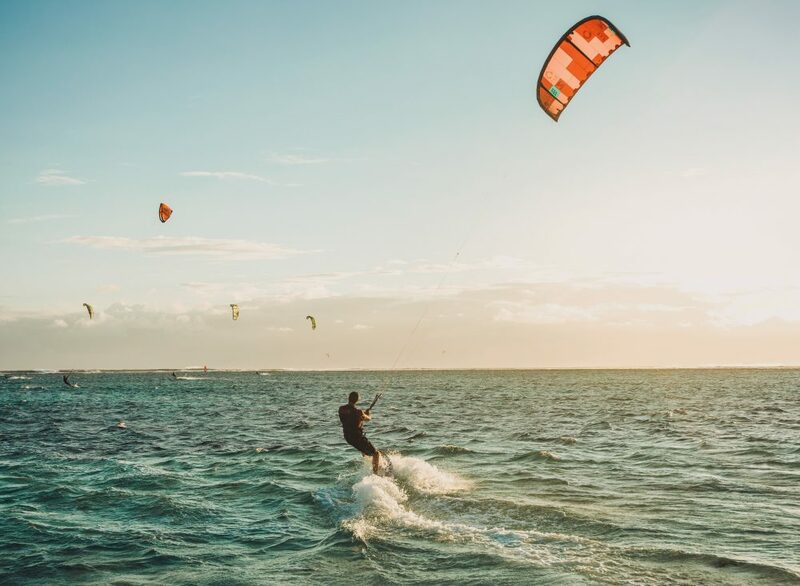 Sanur is the perfect place to try kitesurfing. Sanur has no shortage of places for romantic strolls on your honeymoon, but one of the prettiest has to be the Bali Orchid Garden. This mini botanical Garden in Sanur focuses on the breeding and cultivation of tropical orchids and is home to several rare species of the flower. Besides orchids, the garden also has many other species of rare tropical plants, all of them beautiful and fascinating. Nature lovers should check out Bali Sharks during their honeymoon in Sanur, for a fun and interesting day trip. This nature conservation site is located on nearby Serangan island and is on a mission to save the reef sharks of Bali. Visitors can look around the shark nursery, turtle hatchery and marine garden aquarium with an environmentally-friendly tour of the facilities. The Blanjong Pillar is Bali’s oldest historical artefact and is the main tourist attraction in Sanur. The stone inscription is thought to date all the way back to 914AD, during the reign of King Sri Kesari Warmadewa. For honeymooners interested in the history of Bali, this is a must-see while you’re in Sanur. This classy and elegant restaurant is the perfect setting for a romantic meal on your honeymoon in Sanur. Their large, airy seating area and delicious menu are sure to leave you spellbound! Lilla Pantai is one of the best spots in Sanur for a romantic, sunset dinner by the sea. Spilling over onto the sand of Sanur Beach, this cosy restaurant has a relaxed, romantic atmosphere and outstanding food. For an intimate meal for two on your honeymoon, Lilla Pantai is a must-visit. 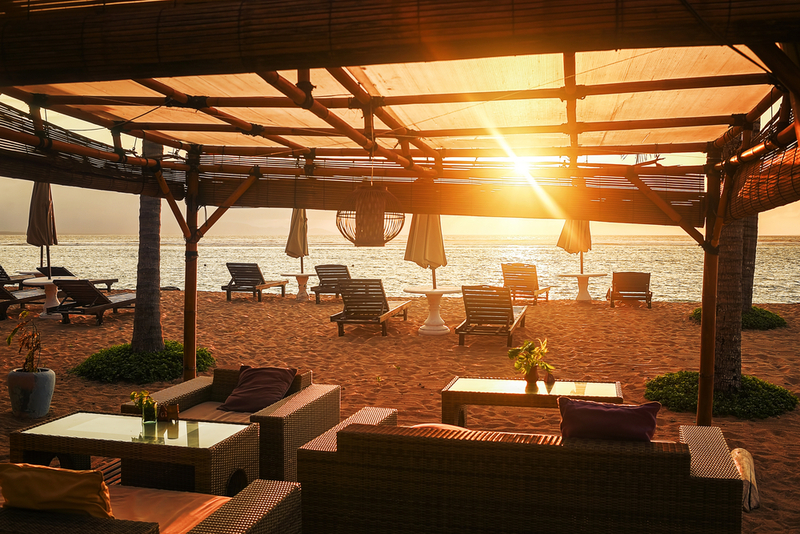 Sanur has plenty of places for a romantic sunset dinner. Finding good Italian food in southeast Asia can be a challenge, but The Village won’t disappoint you. Couples can enjoy authentic pasta, pizza and seafood dishes in relaxed and stylish surroundings and sample from their extensive wine list. For a traditional; and delicious Italian meal for two on your honeymoon, The Village is the place to be. Situated near Bali’s breathtaking Twin Lakes, the Nung Nung Waterfall is a great destination for adventurous honeymooners. 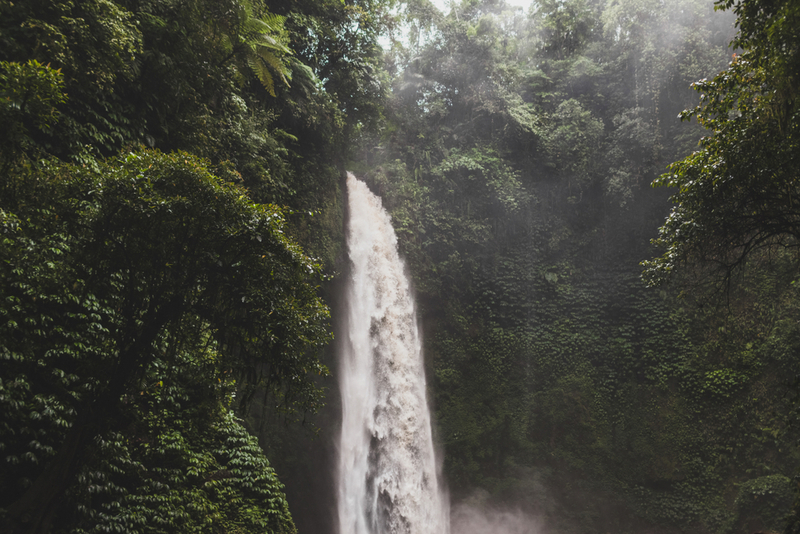 Nung Nung is one of the tallest falls in Bali and is even more impressive during the rainy season when the surrounding foliage is at its greenest. Climb down the 500 steps to reach the bottom of the cascade, for a romantic afternoon of exploring Bali’s jungles. Visit the magical Nung Nung waterfall on your honeymoon. Honeymooners in Bali should take a trip to Angel’s Billabong if at all possible, for a magical and romantic experience. This breathtakingly clear tide pool drops away to the ocean below at low tide and is one of the most beautiful swimming spots in Bali. Spend hours floating in the cool, crystalline waters with your loved one, for a honeymoon experience neither of you will forget. 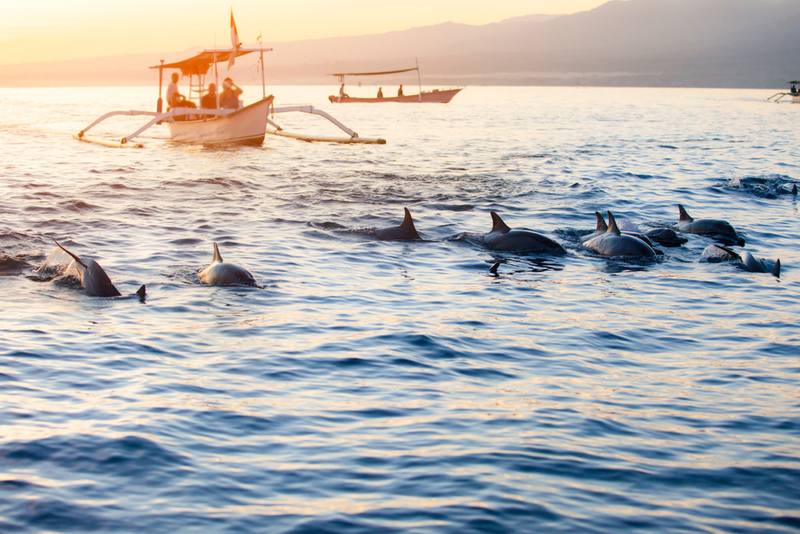 Go dolphin watching off the coast of Lovina during your honeymoon. For a fairytale experience you’ll never forget, take a dolphin watching trip during your honeymoon in Bali. These tours run frequently from Lovina and are an incredible opportunity to see these beautiful creatures in their natural environment. Take an early morning expedition to see the sunrise from the boat, for a romantic outing you’ll remember always.